Change in total number of manufacturing jobs in metropolitan areas, 1954–2002 (figures for New England are from 1958). Three metropolitan areas lost more than four fifths of their manufacturing jobs: Steubenville, OH; Johnstown, PA, and Augusta, ME. Change in per capita personal income in metropolitan counties, 1980–2002, relative to the average for U.S. metropolitan areas. The Rust Belt is a term, sometimes considered pejorative, for an informal region of the United States that experienced industrial decline starting around 1980. It is made up mostly of places in the Midwest and Great Lakes, though definitions vary. 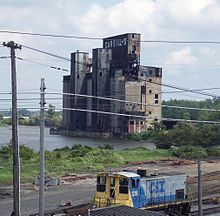 Rust refers to the deindustrialization, or economic decline, population loss, and urban decay due to the shrinking of its once-powerful industrial sector. The term gained popularity in the U.S. in the 1980s. The Rust Belt begins in central New York and traverses west through Pennsylvania, West Virginia, Ohio, Indiana, and the Lower Peninsula of Michigan, ending in northern Illinois, eastern Iowa, and southeastern Wisconsin. New England was also hard hit by industrial decline during the same era. Industry has been declining in the region, which was previously known as the industrial heartland of America, since the mid-20th century due to a variety of economic factors, such as the transfer of manufacturing overseas, increased automation, and the decline of the US steel and coal industries. While some cities and towns have managed to adapt by shifting focus towards services and high-tech industries, others have not fared as well, witnessing rising poverty and declining populations. In the 20th century, local economies in these states specialized in large-scale manufacturing of finished medium to heavy industrial and consumer products, as well as the transportation and processing of the raw materials required for heavy industry. The area was referred to as the Manufacturing Belt, Factory Belt, or Steel Belt as distinct from the agricultural Midwestern states forming the so-called Corn Belt and Great Plains states that are often called the "bread-basket of America". The flourishing of industrial manufacturing in the region was caused in part by the proximity to the Great Lakes waterways, and abundance of paved roads, water canals and railroads. After the transportation infrastructure linked the iron ore found in northern Minnesota, Wisconsin and Upper Michigan with the coal mined from Appalachian Mountains, the Steel Belt was born. Soon it developed into the Factory Belt with its great American manufacturing cities: Chicago, Buffalo, Detroit, Milwaukee, Cincinnati, Toledo, Cleveland, St. Louis, and Pittsburgh among others. This region for decades served as a magnet for immigrants from Austria-Hungary, Poland and Russia who provided the industrial facilities with inexpensive labor. Following several "boom" periods from the late-19th to the mid-20th century, cities in this area struggled to adapt to a variety of adverse economic and social conditions. From 1979 to 1982, the US Federal Reserve decided to raise the base interest rate in the United States to 19%. High interest rates attracted wealthy foreign "hot money" into US banks and caused the US dollar to appreciate. This made US products more expensive for foreigners to buy and also made imports much cheaper for Americans to purchase. The misaligned exchange rate was not rectified until 1986, by which time Japanese imports in particular had made rapid inroads into US markets. From 1987 to 1999, the US stock market went into stratospheric rise, and this continued to pull wealthy foreign money into US banks, which biased the exchange rate against manufactured goods. Related issues include the decline of the iron and steel industry, the movement of manufacturing to the southeastern states with their lower labor costs, the layoffs due to the rise of automation in industrial processes, the decreased need for labor in making steel products, new organizational methods such as just-in-time manufacturing which allowed factories to maintain production with fewer workers, the internationalization of American business, and the liberalization of foreign trade policies due to globalization. Cities struggling with these conditions shared several difficulties, including population loss, lack of education, declining tax revenues, high unemployment and crime, drugs, swelling welfare rolls, deficit spending, and poor municipal credit ratings. As people migrate, they often coin new names for their destinations. Since the term "Rust Belt" pertains to a set of economic and social conditions rather than to an overall geographical region of the United States, the Rust Belt has no precise boundaries. The extent to which a community may have been described as a "Rust Belt city" depends at least as much on how great a role industrial manufacturing played in its local economy in the past and how it does now, as on perceptions of the economic viability and living standards of the present day. News media occasionally refer to a patchwork of defunct centres of heavy industry and manufacturing across the Great Lakes and mid-western United States as the snow belt, the manufacturing belt, or the factory belt - because of their vibrant industrial economies in the past. This includes most of the cities of the Midwest as far west as the Mississippi River, including St. Louis, and many of those in the Great Lakes and Northern New York.. At the centre of this expanse lies an area stretching from northern Indiana and southern Michigan in the west to Upstate New York in the east, where local tax revenues as of 2004[update] relied more heavily on manufacturing than on any other sector. Before World War II, the cities in the Rust Belt region were among the largest in the United States. However, by the twentieth century's end their population had fallen the most in the country. The linking of the former Northwest Territory with the once-rapidly industrializing East Coast was affected through several large-scale infrastructural projects, most notably the Erie Canal in 1825, the Baltimore and Ohio Railroad in 1830, the Allegheny Portage Railroad in 1834, and the consolidation of the New York Central after the American Civil War. A gate was thereby opened between a variety of burgeoning industries on the interior North American continent and the markets not only of the large Eastern cities, but of Western Europe as well. Coal, iron ore and other raw materials were shipped in from surrounding regions which emerged as major ports on the Great Lakes and served as transportation hubs for the region with a proximity to railroad lines. Coming in the other direction were millions of European immigrants, who populated the cities along the Great Lakes shores with then-unprecedented speed. Chicago, famously, was a rural trading post in the 1840s but grew to be as big as Paris by the time of the 1893 Columbian Exposition. Early signs of the difficulty in the northern states were evident early in the 20th century, before the "boom years" were even over. Lowell, Massachusetts, once the centre of textile production in the United States, was described in the magazine Harper's as a "depressed industrial desert" as early as 1931, as its textile concerns were being uprooted and sent southward, primarily to the Carolinas. After the Great Depression, American entry into the Second World War effected a rapid return to economic growth, during which much of the industrial North reached its peak in population and industrial output. The northern cities experienced changes that followed the end of the war, with the onset of the outward migration of residents to newer suburban communities, and the declining role of manufacturing in the American economy. Outsourcing of manufacturing jobs in tradeable goods has been an important issue in the region. One source has been globalization and the expansion of worldwide free trade agreements. Anti-globalization groups argue that trade with developing countries has resulted in stiff competition from countries such as China which pegs its currency to the dollar and has much lower prevailing wages, forcing domestic wages to drift downward. Some economists are concerned that long-run effects of high trade deficits and outsourcing are a cause of economic problems in the U.S. with high external debt (amount owed to foreign lenders) and a serious deterioration in the United States net international investment position (NIIP) (−24% of GDP). Some economists contend that the U.S. is borrowing to fund consumption of imports while accumulating unsustainable amounts of debt. On June 26, 2009, Jeff Immelt, the CEO of General Electric, called for the United States to increase its manufacturing base employment to 20% of the workforce, commenting that the U.S. has outsourced too much in some areas and can no longer rely on the financial sector and consumer spending to drive demand. Since the 1960s, the expansion of worldwide free trade agreements have been less favorable to U.S. workers. Imported goods such as steel cost much less to produce in Third World countries with cheap foreign labor (see steel crisis). Beginning with the recession of 1970–71, a new pattern of deindustrializing economy emerged. Competitive devaluation combined with each successive downturn saw traditional U.S. manufacturing workers experiencing lay-offs. In general, in the Factory Belt employment in the manufacturing sector declined by 32.9% between 1969 and 1996. Wealth-producing primary and secondary sector jobs such as those in manufacturing and computer software were often replaced by much-lower-paying wealth-consuming jobs such as those in retail and government in the service sector when the economy recovered. A gradual expansion of the U.S. trade deficit with China began in 1985. In the ensuing years the U.S. developed a massive trade deficit with the East Asian nations of China, Japan, Taiwan, and South Korea. As a result, the traditional manufacturing workers in the region have experienced economic upheaval. This effect has devastated government budgets across the U.S. and increased corporate borrowing to fund retiree benefits. Some economists believe that GDP and employment can be dragged down by large long-run trade deficits. A March 3, 2008 Wall Street Journal editorial claimed that, while Ohio lost 10,000 jobs in the past decade, Texas created 1.6 million new jobs. The editorial stated, "Ohio's most crippling handicap may be that its politicians—and thus its employers—are still in the grip of such industrial unions as the United Auto Workers." A September 13, 2008 opinion column by Phil Gramm and Mike Solon stated, "Yes, Michigan lost 83,000 auto manufacturing jobs during the past decade and a half, but more than 91,000 new auto manufacturing jobs sprung up in Alabama, Tennessee, Kentucky, Georgia, South Carolina, Virginia and Texas." Francis Fukuyama considers the social and cultural consequences of deindustrialization and manufacturing decline that turned a former thriving Factory Belt into a Rust Belt as a part of a bigger transitional trend that he called the Great Disruption: "People associate the information age with the advent of the Internet in the 1990s, but the shift from the industrial era started more than a generation earlier, with the deindustrialization of the Rust Belt in the United States and comparable movements away from manufacturing in other industrialized countries. … The decline is readily measurable in statistics on crime, fatherless children, broken trust, reduced opportunities for and outcomes from education, and the like". Problems associated with the Rust Belt persist even today, particularly around the eastern Great Lakes states, and many once-booming manufacturing metropolises dramatically slowed down. From 1970 to 2006, Cleveland, Detroit, Buffalo, and Pittsburgh lost about 45% of their population and median household incomes fell: in Cleveland and Detroit by about 30 percent, in Buffalo by 20 percent, and Pittsburgh by 10 percent. It seemed that during the mid-1990s in several Rust Belt metro areas the negative growth was suspended as indicated by major statistical indicators: unemployment, wages, population change. However, during the first decade of the 21st century, a negative trend persisted: Detroit lost 25.7% of its population; Gary, Indiana – 22%; Youngstown, Ohio – 18.9%; Flint, Michigan – 18.7%; and Cleveland, Ohio – 14.5%. In the late-2000s, American manufacturing recovered faster from the Great Recession of 2008 than the other sectors of the economy, and a number of initiatives, both public and private, are encouraging the development of alternative fuel, nano and other technologies. Together with the neighboring Golden Horseshoe of Southern Ontario, Canada, the so-called Rust Belt still composes one of the world's major manufacturing regions. Since the 1980s, presidential candidates have devoted much of their time to the economic concerns of the Rust Belt region, which contains the populous swing states of Pennsylvania, Ohio, and Michigan. Those states were also critical and decisive to Donald Trump's victory in the 2016 US Presidential Election. Different strategies were proposed in order to reverse the fortunes of the former Factory Belt including building casinos and convention centers, retaining the so-called "creative class" through arts and downtown renewal, encouraging the “knowledge” economy type of entrepreneurship, etc. Lately, analysts suggested that industrial comeback might be the actual path for the future resurgence of the region. That includes growing new industrial base with a pool of skilled labor, rebuilding the infrastructure and infrasystems, creating R&D university-business partnerships, and close cooperation between central, state and local government and business. New types of R&D-intensive nontraditional manufacturing have emerged recently in Rust Belt, such as biotechnology, the polymer industry, infotech, and nanotech. Infotech in particular creates a promising venue for the Rust Belt's revitalization. Among the successful recent examples is the Detroit Aircraft Corporation, which specializes in unmanned aerial systems integration, testing and aerial cinematography services. In Pittsburgh, robotics research centres and companies such as National Robotics Engineering Center and Robotics Institute, Aethon Inc., American Robot Corporation, Automatika, Quantapoint, Blue Belt Technologies and Seegrid are creating state-of-the-art robotic technology applications. Akron, a former "Rubber Capital of the World" that lost 35,000 jobs after major tire and rubber manufacturers Goodrich, Firestone and General Tire closed their production lines, is now again well known around the world as a centre of polymer research with four hundred polymer-related manufacturing and distribution companies operating in the area. The turnaround was accomplished in part due to a partnership between Goodyear Tire & Rubber, which chose to stay, the University of Akron and the city mayor's office. The Akron Global Business Accelerator that jump-started a score of successful business ventures in Akron resides in the refurbished B.F. Goodrich tire factory. Additive manufacturing, or 3D printing, creates another promising venue for the manufacturing resurgence. Such innovative companies, as MakerGear from Beachwood, Ohio, or ExOne Company from North Huntingdon, PA, are designing and manufacturing industrial and consumer products using 3-D imaging systems. Not long ago, the London-based Economist pointed towards a growing trend of reshoring, or inshoring, of manufacture when a growing number of American companies are moving their production facilities from overseas back home. Rustbelt states can ultimately benefit from this process of an international insourcing. However, automation has led to the types of manufacturing that requires fewer workers even with advanced skills. That is why job gains in manufacture in Rust Belt have not been nearly enough to keep pace with lay-offs. As a result, middle class incomes and savings in the Rustbelt states continue to be negatively impacted. Delving into the past and musing on the future of Rustbelt states, the Brookings Institution report suggests that the Great Lakes region has a sizable potential for transformation, citing already existing global trade networks, clean energy/low carbon capacity, developed innovation infrastructure and higher educational network. Southern Ontario - Canadian counterpart, the Canadian Rust belt does not include Toronto and Ottawa. This area could be considered a geographic and economic extension of the US Rust Belt. 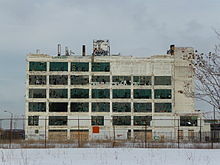 ^ Crandall, Robert W. The Continuing Decline of Manufacturing in the Rust Belt. Washington, D.C.: Brookings Institution, 1993. ^ Leeman, Mark A. From Good Works to a Good Job: An Exploration of Poverty and Work in Appalachian Ohio. PhD dissertation, Ohio University, 2007. ^ Teaford, Jon C. Cities of the Heartland: The Rise and Fall of the Industrial Midwest. Bloomington: Indiana University Press, 1993. ^ Meyer, David R. 1989. "Midwestern Industrialization and the American Manufacturing Belt in the Nineteenth Century." Journal of Economic History 49(4):921–937. ^ Fifty States: The Heartland. ^ McClelland, Ted. Nothin' but Blue Skies: The Heyday, Hard Times, and Hopes of America's Industrial Heartland. New York: Bloomsbury Press, 2013. ^ High, Steven C. Industrial Sunset: The Making of North America's Rust Belt, 1969–1984. Toronto: University of Toronto Press, 2003. ^ Jargowsky, Paul A. Poverty and Place: Ghettos, Barrios, and the American City. New York: Russell Sage Foundation, 1997. ^ Hagedorn, John M., and Perry Macon. People and Folks: Gangs, Crime and the Underclass in a Rustbelt City. Lake View Press, Chicago, IL, (paperback: ISBN 0-941702-21-9; clothbound: ISBN 0-941702-20-0), 1988. ^ Beeson, Patricia E. "Sources of the decline of manufacturing in large metropolitan areas." Journal of Urban Economics 28, no. 1 (1990): 71–86. ^ Higgins, James Jeffrey. Images of the Rust Belt. Kent, Ohio: Kent State University Press, 1999. ^ "Sun On The Snow Belt (editorial)". Chicago Tribune. August 25, 1985. Retrieved September 22, 2011. The Northern states, once the foundry of the nation, are known now as the Rust Belt or the Snow Belt, in invidious comparison to the supposedly booming Sun Belt. ^ "Measuring Rurality: 2004 County Typology Codes". USDA Economic Research Service. Archived from the original on 2011-09-14. Retrieved September 21, 2011. ^ Garreau, Joel. The Nine Nations of North America. Boston: Houghton Mifflin, 1981. ^ Hansen, Jeff; et al. (March 10, 2007). "Which Way Forward?". The Birmingham News. Retrieved September 21, 2011. ^ a b Kunstler, James Howard (1996). Home From Nowhere: Remaking Our Everyday World for the 21st Century. New York: Touchstone/Simon and Schuster. ISBN 978-0-684-83737-6. ^ "Who Makes It?". Retrieved 28 November 2011. ^ Marion, Paul (November 2009). "Timeline of Lowell History From 1600s to 2009". Yankee Magazine. ^ "1990 Population and Maximum Decennial Census Population of Urban Places Ever Among the 100 Largest Urban Places, Listed Alphabetically by State: 1790–1990". United States Bureau of the Census. Retrieved September 22, 2011. ^ a b c Bivens, L. Josh (December 14, 2004). Debt and the dollar Archived 2004-12-17 at the Wayback Machine Economic Policy Institute. Retrieved on June 28, 2009. ^ Roberts, Paul Craig (August 7, 2003).Jobless in the USA Newsmax. Retrieved on June 23, 2009. ^ Hira, Ron and Anil Hira with forward by Lou Dobbs, (May 2005). Outsourcing America: What's Behind Our National Crisis and How We Can Reclaim American Jobs. (AMACOM) American Management Association. Citing Paul Craig Roberts, Paul Samuelson, and Lou Dobbs, pp. 36–38. ^ a b Cauchon, Dennis and John Waggoner (October 3, 2004).The Looming National Benefit Crisis. USA Today. ^ a b c Phillips, Kevin (2007). Bad Money: Reckless Finance, Failed Politics, and the Global Crisis of American Capitalism. Penguin. ISBN 978-0-14-314328-4. ^ Kahn, Matthew E. "The silver lining of rust belt manufacturing decline." Journal of Urban Economics 46, no. 3 (1999): 360–376. ^ a b David Friedman (Senior Fellow at the New America Foundation). No Light at the End of the Tunnel, Los Angeles Times, June 16, 2002. ^ Fukuyama, Francis. The Great Disruption: Human Nature and the Reconstitution of Social Order. New York: Free Press, 1999. ^ Francis Fukuyama. The Great Disruption, The Atlantic Monthly, May 1999, Volume 283, No. 5, pages 55–80. ^ Feyrer, James, Bruce Sacerdote, and Ariel Dora Stern. Did the Rust Belt Become Shiny? A Study of Cities and Counties That Lost Steel and Auto Jobs in the 1980s. Brookings-Wharton Papers on Urban Affairs (2007): 41–102. ^ Mark Peters, Jack Nicas. "Rust Belt Reaches for Immigration Tide", The Wall Street Journal, May 13, 2013, A3. ^ "City and Town Population Totals: 2010-2017". ^ "Greening the rustbelt: In the shadow of the climate bill, the industrial Midwest begins to get ready". The Economist. August 13, 2009. Retrieved September 21, 2011. ^ Beyers, William. "Major Manufacturing Regions of the World". Department of Geography, the University of Washington. Retrieved September 21, 2011. ^ Michael McQuarrie (2017-11-08). "The revolt of the Rust Belt: place and politics in the age of anger". The British Journal of Sociology. 68 (S1): S120–S152. doi:10.1111/1468-4446.12328 (inactive 2019-02-12). PMID 29114874. ^ Sherry Karabin. Mayor says attitude is key to Akron’s revitalization. The Akron Legal News, May 16, 2013. ^ "Conference in Pittsburgh shows growing allure of 3-D printing". By Len Boselovic / Pittsburgh Post-Gazette. June 13, 2013. Retrieved 2013-06-20. ^ "Coming home: A growing number of American companies are moving their manufacturing back to the United States". The Economist. Jan 19, 2013. Retrieved 2013-06-20. ^ Faberman, R. Jason. "Job flows and labor dynamics in the US Rust Belt." Monthly Labor Review. 125 (2002): 3. ^ John C. Austin, Jennifer Bradley and Jennifer S. Vey. The Next Economy: Economic Recovery and Transformation in the Great Lakes Region.. Brookings Institution Paper, September 27, 2010. Engerman, Stanley L., and Robert E. Gallman. The Cambridge Economic History of the United States: The Twentieth Century. New York: Cambridge University Press, 2000. Meyer, David R. (1989). "Midwestern Industrialization and the American Manufacturing Belt in the Nineteenth Century". The Journal of Economic History. 49 (4): 921–937. doi:10.1017/S0022050700009505. ISSN 0022-0507. JSTOR 2122744.